Coslys Organic Skincare moisturizes and nourrishes dry and sensitive skins. Rich in Organic Shea Butter and Organic Apricot Kernel Oil, its rich and creamy texture is a real pleasure every morning ! 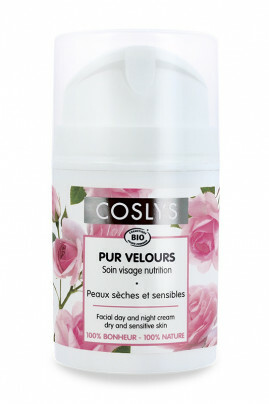 Protected from climatic agressions with Coslys Organic Rose Face Cream, your skin is smooth and glowy. Apply Coslys Organic Rose Skincare every morning and night on dry clean skin (face and neck), massage gently onto the skin. Coslys 99% natural face cream is your skin's best friend ! Aqua (eau), spiraea ulmaria flower extract* (meadowsweet floral water), decyl oleate (emollient from coconut and copra), caprylic/capric triglyceride (emollient from coconut and vegetal glycerin), glyceryl stearate SE (emulsifier from coconut and palm-kernel), glyceryl stearate (emulsifier from coconut and palm-kernel), glycerin (vegetal glycerin), anthemis nobilis flower water* (organic camomile floral water), prunus armeniaca (apricot) kernel oil* (organic apricot kernel oil), cetearyl alcohol (vegetal emulsifier), sodium PCA (beetroot derived moisturizing active), butyrospermum parkii (shea) butter*, oleic/linoleic/linolenic polyglycerides (vegetal emollient), rosa damascena flower extract* (organic rose extract), cetyl palmitate (vegetal thickener), cocoglycerides, xanthan gum (thickener), bisabolol (active from candeia oil : brazilian tree), parfum (100% natural fragrance), benzyl alcohol (conservative), citric acid (pH regulator), dehydroacetic acid (pH regulator), tocopherol (natural vitamin E), glycine soja (soybean) oil (non OGM soybean extract), linalool, limonene, citronellol, benzyl salicylate, geraniol (components naturally present in the fragrance).